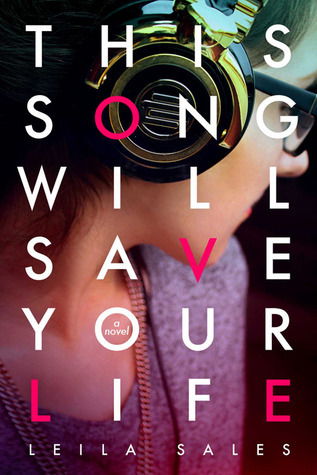 This Song Will Save Your Life was fresh and quirky, but also emotional and sobering. It had some hard-hitting messages masked under sarcasm and exhilaration. It was the best qualities of the books I like reading when I’m sad but with dizzying highs of reading a book textured with romance and self-discovery. It talked about when “being yourself” didn’t seem good enough for everybody else. I loved Elise. She wasn’t exactly sure what set her apart. Or what happens when trying isn’t good enough and people try to trash her anyways. She stayed optimistic throughout that. She reminded me of Jessica Darling but with the quirky edge of George Nicholson and other beloved heroines throughout YA. Elise was thoughtful and hilarious. She always had a positive spin on things. If I had been in her position, I would not be able to cope half as well, and she remained so rooted in who she was. So many books like this try to be too much of one thing. They try to fix everything too quickly. This one was real. Elise had flaws, she did flawed things, her plans were flawed. The romance was a bit skewed. Her parents reacted realistically and sometimes, she pushed too much and it had consequences. It had the exhilaration of a one-sitting escape from reality read but with the heart of a real story that will echo deeply. Elise’s passion for music was one of my favorite parts of the novel. It was really potent but not overwhelming. She really loved her music and what she could do with it. She tended to focus on “projects”. She would pick one thing and get really intense about it, and she focused so hard on it that she ended up getting really good at whatever she chose. It really revealed little bits about her personality that I absolutely adored. DJ-ing started out as a project but it turned into something that she really adored, something that became a part of her personality so ingrained that it helped her escape the rest of her life, which was slowly dissolving into a nightmare. While it could be whimsical, it was never melodramatic or came off fake in any way. It was rough and it was realistic but still spun everything that didn’t make it a bummer to read. It was hopeful and thoughtful but still shiny in the sense that it was a fun read. Vicky and Pippa were such entertaining characters. The entire cast of characters in This Song Could Save Your Life were witty and dynamic. Elise really changed throughout the book. She remained, at the core, the philosophical girl who was so sure of what she loved but she started to become even more confident in herself. She was such a sweetheart and so spunky – she reminded me of Sophie from Hex Hall or Georgia from Angus, Thongs, and Full Frontal Snogging. The book didn’t focus on romance but it was definitely a fun, complicated element. It wasn’t black and white romance – there were so many shades of grey with Char especially. It focused on a relationship born out of the possibilities, loneliness, a little adrenaline from DJ-ing all night. It wasn’t the cookie-cutter romance: it was more than a bit messy and it changed to say the least. Blurry. Other relationships got in the way of that one, which cast it in a much more realistic light. I was reminded of It almost reminded me of the strange honesty in Eleanor and Park. Some books about bullying make the entire focus on bullying but this one just added to the suffocated feeling that Elise got, like Eleanor got. It was about an atmosphere where Elise couldn’t be herself and she was scared of what they might do next and she was constantly being attacked for who she was. People viciously tore into her just because of conformity, without even realizing who she really was, only knowing her name or knowing that her personality was different. A fake journal was created online “by Elise” that detailed messages about why she wanted to kill herself and that she hated herself, and people were so captivated by the idea of suicidal/weird Elise that they automatically accepted it. There were some glowing characters in here – people who really encouraged Elise past the days when she felt like she hit rock bottom only to fall further. It was sad and hopeful and beautiful. I loved her family because they weren’t just “there”. They weren’t props. She was disciplined. Her parents had complicated schedules and feelings that factored into a lot of the book and Elise’s actions. I was really comfortable with her parents and family dynamic because the effect that they had is very similar to the effect that my parents have on my life. They’re a part of it and they impacted Elise a lot, which was really conveyed very well in This Song Will Save Your Life. Adding to the realistic nature of the book, her friends meant well. They were mostly friends of convenience but they grew to have more of a relationship throughout the book. They taught each other things and they weren’t perfect friends but they meant the best for Elise and it was really sweet. There were some stereotypes but not caricature. It only added to the breathless scenes and the hilarious banter to have some funky characters thrown in there. They weren’t exaggerated but they were generally realistic. I read it on a bad day so it made me smile so much and so unbelievably happy for being graced with the world that we live in but also crying over the pure uncertainty of everything, the balances of passion and identity, family and difficult circumstances. It might depend on how you’ve experienced middle school and high school, whether this book will deeply resonate with you. It’s definitely a fun read, but it’s definitely one that made me think and weigh the reality of being “special” versus “normal”. There were some scenes (one in particular) that just broke my heart a little. There were others that had me laughing so hard that I cried. It was almost therapeutic in a way. This Song Will Save Your Life had the perfect proportions of all of my favorite things. Young-spirited but mature. It had a spunky heroine with passion, interesting concepts, romance, family, and heavy messages that dealt with real issues. So many books emphasize self-identity and discovery – how did This Song Will Save Your Life handle it differently from other books? Do you think Elise’s relationship with Char was unhealthy, or similar to many relationships nowadays? How does Leila Sales play around with stereotypes? What characters didn’t fit stereotypes? Why might characters such as Jessica Darling and Elise go for runs or walks at night alone instead of during normal hours?